Approach for the start of this one is through the Bellavally Gap to reach the carpark at the scenic viewpoint of Altachullion (137241 A). Walk uphill and take the first turn R along a minor road and then through a gate onto a forest track. A matter then of heading for the open hill on pretty good ground, among the sheep and newly born lambs. There are good views SW to the Iron mtns, which makes up for the non descript top of Benbeg itself. The payoff is when come to the forest reaching up the hillside and set eyes on the long sweeping ridge to the summit of Cuilcagh. The top of Benbeg is reached in an easy 40 mins - it has been "eaten away" and drops down into an area of extensive forest. Keep to the edge of the slope and follow it as drops down and then rises along a well worn track, with stunning views ahead to the steep E nose of Cuilcagh. Pass a little lough with deep green waters below, some rocky outcrops and a final steeper pull to the level summit area of Cuilcaigh (1.5 hrs). Cracking views back along the ridge as it curves towards Benbeg, and another lough i missed from the top. 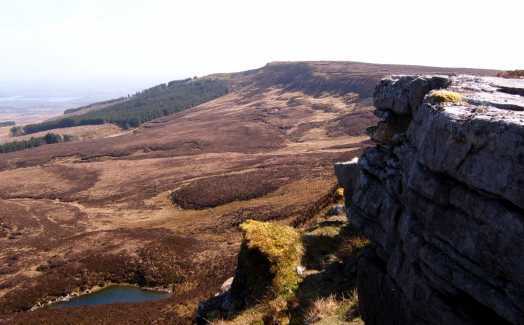 There is a short walk to the large summit cairn and trig point, with views across to the Sligo Hills and the sea of brown of a N approach.